SMART MULTIFUNCTIONAL ROBOT VACUUM CLEANER is designed for pet hair with auto recharging, scheduled cleaning and wet/dry mopping. Low Profile design allows it to navigate under beds, sofas and other hard-to-reach places, focusing on where dirt and dust hide. Also advanced infrared sensors protect your robot from stairs and edges. Air filtration system helps allergic people breath easier. 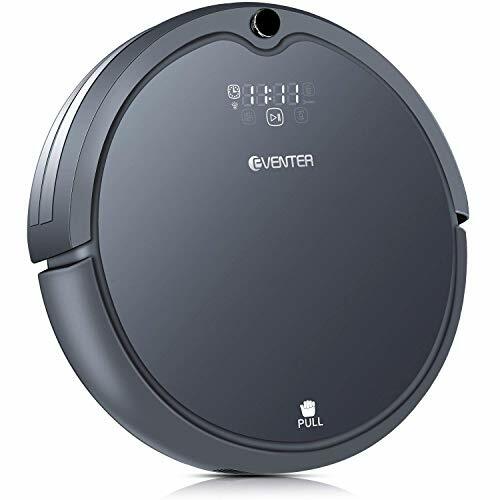 This robot vacuum cleaner does not entirely replace the need for manual cleaning but does reduce the frequency and effort of regular cleaning. Before using your vacuum robot please pick up objects like clothing, loose papers, pull cords for blinds or curtains, power cords, and anything fragile. Your robot vacuum works well on hardwood and tile floors. performance may be poor when used on dark colored floor, carpets and area rugs. The mop is optional and can be removed if you want. Water comes out of the water tank onto the attached mopping cloth, which follows the robot and mops up any particles left behind. This robot vacuum can adjust the suction power. In mute mode, the robot vacuum lowers its suction power to keep quiet in case disturbing you. In powerful mode, it works hard and cleans even tiny dirt on your floors. You can also set daily schedule for your robot vacuum to wake up and start a cleaning job, so it can take place while you’re out of the house. For better cleaning efficiency and stronger suction power, please remove the water tank before starting your robot. ✔HIGH SUCTION-The robot of highest power is 1500pa so that you can clean your room cleanly with the high suction. It highly improves cleaning efficiency and saves up to 30% of electricity. It’s cleaning ability is up to 98% high. It can also clean totally even though the tiny dust. Effectively save the housework time and create more free time for you. ✔ELIMINATE PET HAIR – This robot vacuum is great at picking up pet hair and everything else that might be on the floor. It picks up not only visible dust and debris, but pet dander and other particles that drift down from the air. The strong engine and great suction are powerful enough and work great on pet hair, which can be a pain to remove. ✔INNOVATIVE CLEANING PATH – Not like the traditional random cleaning mode, this robot vacuum creates an optimal zigzag cleaning route without repeating the same cleaning path in a cleaning cycle. It covers all your floors and highly improves the cleaning efficiency. Cliff detect sensors avoid stairs and other drop-offs. Use with the included virtual blocker for more control over where your robot vacuum cleans. ✔30 DAY MONEY BACK GAURANTEE AND 1 YEAR WARRANTY – With pride and confidence, we promise a 30 DAY MONEY BACK GAURANTEE and warrant your robot against defects in material and workmanship for ONE YEAR from Date of Purchase. To obtain warranty service, please contact us.